Linkin Park began 2003 with something completely new by coming out with the LP Underground Tour, which was a tour that specifically allowed LPU members free access to the shows where the band debuted their new live material off of Meteora. 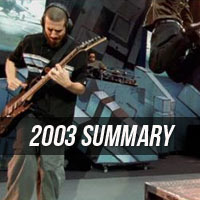 The tour hit six European cities, with stops at Top Of The Pops and CD:UK Headliners in London as well, followed by 10 US shows, featuring an exclusive MTV 2$ Bill Show in Detroit on March 17, and two back-to-back shows in their hometown of Los Angeles centered around the release date of Meteora. Highlights from the LP Underground Tour include the debuts of eight Meteora songs, as well as the first 17 song setlist the band has ever done. Soon after the conclusion of the tour, the band spent no down time by immediately starting their second annual Projekt Revolution Tour, which in 2003 hit the smaller cities that the band had not been to before. After having to cancel the opening night of the tour in Rochester due to a snow storm, the tour kicked off in full session in University Park the following day. The setlist was very unique, with the band debuting a Reanimation song, "P5hng Me A*wy", and also having featuring two very special guests during the set with Xzibit dropping a verse on "Nobody's Listening" (which was played for the first time) and Christian from Blindside joining Chester on "P5hng Me A*wy". Chester's throat problem forced them to cancel an Indiana date, and as fate would see, Chester developed severe abdominal and back pains, which caused the band to cancel its entire June tour in Europe. Linkin Park went back and played Rochester, Council Bluffs, and Valley Center (the latter two cancelled due to the music video shoot in Los Angeles for "Faint") as side shows on the Summer Sanitarium Tour, and played Berlin, Prague, Madrid and Lisboa in September, therefore playing over half of the shows they canceled that year. The band played a rehearsal gig in Las Vegas in late June, and then kicked off on Summer Sanitarium in support of Metallica, which took them across the USA to sports stadiums of all shapes and sizes. In Dallas and Houston, the band shot their first live concert and released Live in Texas on CD/DVD later in the year. The Summer Sanitarium Tour featured the live debuts of "Figure.09" and "Numb" as well as a nightly guitar smash by Brad and Chester after "A Place For My Head". LP wasted no time in returning to Europe after Summer Sanitarium, and played several dates that they had canceled earlier in the year as well as a few other shows. In October, they headed to Australia, where they headlined a major festival, and Asia to play, and then went to the UK in November. In Japan, they brought back "Nobody's Listening" for the first time since Projekt Revolution 2003 and as well as "My December" for the first time since 2002! A few shows later at the Smokeout Festival in California, "Breaking The Habit" (which was rehearsed at the beginning of the year for the LP Underground Tour) received its live debut with a long keyboard intro that immediately became popular with fans. This same version of the song would appear on the LP Underground 4.0 CD the next year (from the Rock am Ring 2004 show). The Fall Tour featured a brand new setlist for the band, with "Papercut" opening for the first time and pushing "Don't Stay" down a few numbers in the set. The core of this setlist would stick with the band for the winter's Meteora World Tour in North America in 2004, featuring the encore of "My December", "P5hng Me A*wy", "A Place For My Head", and "One Step Closer". After playing several holiday shows in late 2003, Linkin Park wrapped up the entire year with a webcasted performance at the KROQ Almost Acoustic Christmas in Los Angeles on December 13. Other highlights from the year included the band's first performances in Malaysia (where they would not return until a decade later in 2013) and South Korea. At the South Korea M&G, the band was presented with a banner from Chinese fans that wanted the band to visit the country - a move the promoter in 2007 cited as a driving force for Linkin Park playing China for the first time! 2003.04.08 Rochester - Reason: Snow storm. 2003.04.11 Evansville - Reason: Chester had a throat infection. 2003.04.28 Council Bluffs - Reason: Faint video shoot. 2003.04.29 Valley Center - Reason: Faint video shoot. 2003.04.30 North Little Rock - Reason: Faint video shoot. 2003.06 European Tour - Reason: Chester had severe back / abdominal pains. This page was last edited on 28 March 2019, at 15:45.